As a direct result, the Samsung Galaxy Note’s performance in our test was quite unusual. While it got a monstrous score on the telephony part, its web browsing endurance were quite disappointing. But let’s not get ahead of ourselves. Traditionally, we start with the talk-time test. The Samsung Galaxy Note turned out the best performer of the three handsets we have seen here, surviving an unthinkable 12 hours and 47 minutes of 3G talk time on a single charge. The result wasn’t that surprising though – with the screen turned off, the power consumption of the Galaxy Note isn’t higher than that of the average smartphone, but the battery is much larger here. Next came the web browsing test, which was the stage of the Galaxy Note’s worst performance. The Note managed just 3 hours and 35 minutes of continuous browsing, which is some way off the standard set by the iPhone 4S and Nokia N9. As most of the web pages are predominantly white, the 5.3″ screen turned into a power-leeching beast that’s hard to feed. The great power hunger is also partially due to the GPU-acceleration of the browser. If you are willing to trade the stock browser for one of the alternatives found on the Android Market you would see worse performance, but slightly better battery life. We repeated the test with Opera Mobile and the Galaxy Note lasted for 4 hours this time. 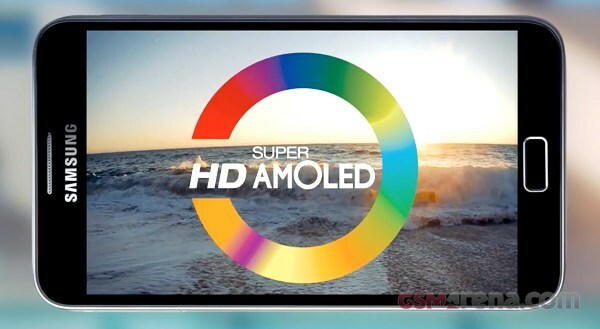 The Samsung Galaxy Note restored some of its pride in the last challenge – the video playback test. It used 90% of its battery after 8 hours and 25 minutes of looping the same SD Xvid video. It’s still worse than what the two smartphones we tested previously achieved, but at least it’s in the same ball park. 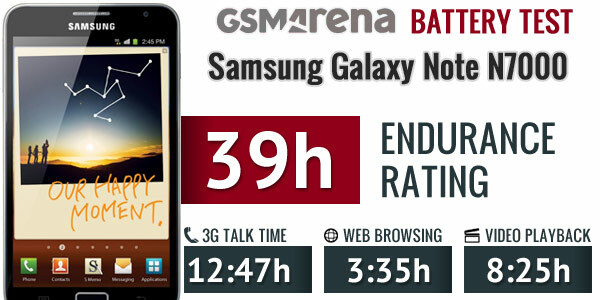 Finally, and most importantly the Samsung Galaxy Note got an endurance rating of 39, which means that you will have to be plug it in every 39 hours if you do 1 hour of using the stock web browser, 3G calls and video playback every day. That’s exactly as much as the N9 got, but not quite as impressive as the 45 hours achieved by the iPhone 4S. If you find yourself confused by all those numbers, check out this post for more details on our new battery test and why did we changed the old one.